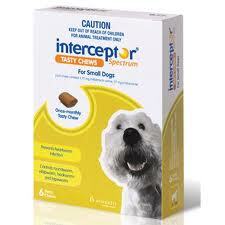 VetShopAustralia would like to offer you a free one month’s sample of Interceptor Spectrum Tasty Chews. We are confident that your dog will love the taste, which is why we have decided to give out a free sample valued at $9.50. When choosing heartworm and worm protection for your dog, it's also important to consider that by making a good choice, you can help protect your family. Tapeworm, hookworm and roundworms can cause illness in humans and children in particularly are susceptible to infection as they often come into close contact with pets. Interceptor Spectrum is a valuable product for preventing heartworm in dogs as well as controlling roundworm, whipworm, hookworm and tapeworm. The worm protection Tasty Chew can be given to your dogs as young as 2 weeks old and provides guaranteed effectiveness which is reassuring when deciding on which product will be best for your dog. Find out how to get your FREE Interceptor Spectrum sample. View our complete range of Interceptor products.